Home / Blackjack / What is Shuffle Tracking in Blackjack? 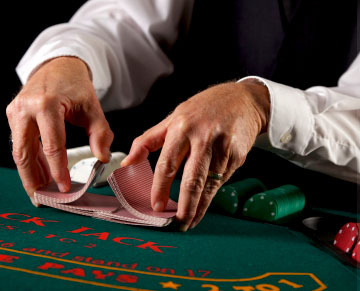 Once you become an expert at card counting, a good way to upgrade your Blackjack skills is to learn shuffle tracking. Compared to card counting, shuffle tracking is more difficult to master, especially since it’s typically used simultaneously with card counting. Another thing that makes shuffle tracking challenging is the fact it demands long attention span and strong focus on the game. Still, don’t let this discourage you! As a relatively new advanced strategy in Blackjack, shuffle tracking is not yet covered in Blackjack literature extensively, but a sufficient knowledge on this technique can be found anyway. Mastering it will take some time, but the effort is well worth it. The idea behind shuffle tracking is that dealers who shuffle large stacks of cards will use simpler shuffles; due to this, groups of cards that have been played will stay clumped together. Tracker typically memorises groups of tens or face cards after they are played, and then waits for them to re-emerge: this enables the tracker to predict some of the upcoming cards after the shuffle. Clearly, shuffle tracking requires some things. First of all, the right kind of casino game with a human dealer – the tracking will not work in online casinos, or in renowned casinos that use automated shuffling. Similarly, it doesn’t help in games which use half cut method. Secondly, shuffle tracking is ideally used in 6 to 8 decks Blackjack game – since a larger stack of cards makes the shuffle simpler. The advice is to try out shuffle tracking in various land casinos and play with different dealers, until you find the ideal gambling conditions. Keep a sharp eye on the cards and good luck!